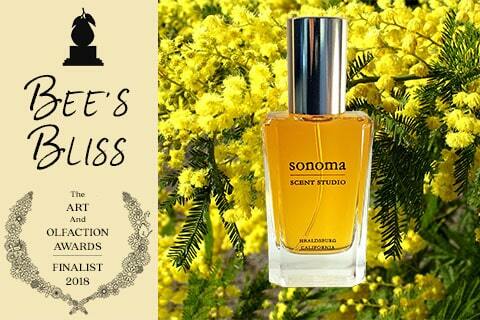 I’m very happy to announce that Sonoma Scent Studio Bee’s Bliss is a Finalist in this year’s Artisan Category of the Art and Olfaction Awards! I’m so pleased and excited — this recognition really means a lot to me. The 2018 Finalists were announced in a special press event at Esxence in Milan today. The Fifth Annual Art and Olfaction Awards event will take place in a public ceremony at the historic Tabernacle in London on April 21, 2018. 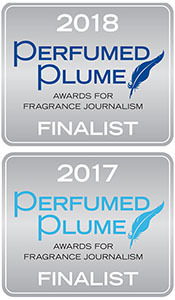 This year’s entries included hundreds of perfumes from artisan and indie perfumers in countries around the world; I’m very honored to have Bee’s Bliss included in the top ten Finalists of the Artisan category. Congrats to all the Finalists! Now I need to find the right person to take over this formula from me! I’m still looking for the right person/team to continue production of the SSS scents. It’s been hard to do much on that front since early January because my wrists have been out of commission, but I’m healing and can start working on that again. Congratulations, my dear Laurie. That is brilliant. Credit where credit is (so richly) deserved! Couldn’t have come at a better time to make your reputation rock-solid — even more than it is already — and impress prospective new owners. Hope you’re continuing to feel better and better. Congragulations! Hope you can find that right person soon, too! Thanks, Loretta! I hope so! Congratulations! I hope you win 🙂 AND I hope I’ll get to try it someday. Congratulations, Laurie!! I am so glad I went with my gut and bought a small bottle when you first released it- it is truly an amazing perfume. Best wishes for quick healing, and to find someone who can put this lovely perfume in production again! I couldn’t be happier for you, Laurie – Congratulations! Keep working on healing those wrists so you can “spread” the Bliss! Oh Laurie, I am so happy for you! I absolutely adore Bee’s Bliss, and I’m so glad I purchased a full bottle! I’m so glad you are starting to feel better!! Thanks, Cathy!! <3 I'm glad you got a bottle, too! Hi there…just wanted to chime in again and let you know I’m still interested in purchases. I discovered your fragrance literally the same month you retired, so I was very disappointed to hear none of the samples I’ve tried (I’m into the naturals) would be available; they are terrific and exactly the kind of fragrance products I’m always looking for. Thanks, Tim! <3 Glad you've enjoyed the scents and hope to eventually get some to you. I hope to see more all-natural scents added to the Naturals Collection. Will keep everyone posted on the SSS status here on the blog. I'm still having discussions with several interested people. Glad to hear of your slow and steady progress, and that things with your dad are improving too. Congratulations on your nomination, and richly deserved it is. Congrats! I got a set of samples a while ago, and everything was amazing, each scent was so beautiful and harmonious. I was so sad when I came back to buy a full size and saw that you’re retiring. I’m sure you’ll find someone soon, sounds like a dream job. Can’t wait to try Bee’s Bliss in the future! Congratulations! I hope I’ll get a chance to try Bee’s Bliss soon. Either I was totally oblivious before, or the SSS homepage appears to have some new graphics highlighting award-winning fragrances. I hope this is a sign of some activity behind the scenes. 🙂 Laurie, I hope you are well! Thanks, Magdalena! Yes, I made the new slides on the home page just a few months ago. I wanted to replace the personal pics I’d used before and highlight some of the fragrances. I was trying to get the site ready to transfer to someone new, but I’ve had to put that on hold while my wrists continue to heal.